Yes these is a BRAND NEW IRONS still in the factory box! BAM!!! 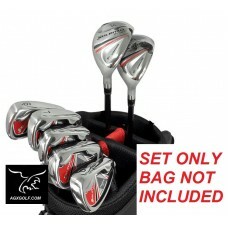 THE SAME COMPANY THAT BRINGS THE ORLIMAR GOLF CLUBS TO THE PGA PRO'S HAS DESIGNED THE FIRELINE SENIOR EDITION IRONS..! The Manufacturer's Suggested Retail Price for this set is $299.95 Your price is MUCH BETTER!! Set includes One year Manufacturers WARRANTY!! This set of Irons from ORLIMAR GOLF is an ADVANCED full technology set!! The club head design technology, plus the SUPERIOR EXTREME MODULUS CARBON Graphite Shaft Technology produces a club with awesome swing speed and distance. The masterfully crafted Irons are real "shot makers"! The CALLAWAY TOUR STYLE IRONS make it much easier to hit a nice HIGH STRAIGHT shot while still allowing you to "work" or "shape" your shots!! "these Irons have a wide and multi-functional sole design that combines a low center of gravity for the ultimate in game improvement playability providing an unbeatable combo of power and feel. The perimeter weighting creates high MOI for unsurpassed forgiveness while the over sized club face gives confidence to all levels of golfers. The cavity insert helps to dampen unwanted vibrations and provides a more solid feel at impact. This design is perfect for golfers looking for an iron to improve their game. The HYBRIDS offer a higher MOI and tremendous forgiveness for long and straight results. The CG is positioned lower and farther back which makes the club easy to launch high and long. What makes the PERIMETER WEIGHTING so effective is the Physics behind it: Having the weight distributed to the perimeter of club head increases the moment of inertia; this reduces the torsional rotation of the club head. Simply put: the club head is more likely to come through the ball "square" and that means more straight shots and less hooks and slices!!! We are very VERY pleased the styling and craftsmanship of these clubs"! 4 and 5 "Hybrid" Irons: combine the power of a wood with the accuracy of an iron. 6,7,8,9 IRONS and Pitching Wedge: Stainless Steel heads, U-CUT/Cavity back and Perimeter weighted and OVER SIZED for maximum forgiveness and accuracy. The Low Gravity construction provides tremendous power and loft. MATCHING HEAD COVERS for Hybrids. ORLIMAR GOLF and AGXGOLF are headquartered right here in Michigan and they've been around for a long time (even longer than we have)! We've been playing their Golf Clubs since we were kids and have been nothing but satisfied and we GUARANTEE that you will be too! !